187 labyrinths found. Showing 21-40. Sorted by country, state, city, then zip/postal code. located to the east of Bedford, about one mile from the town centre. Top-down view of labyrinth garden layout. Corner of Marsh House Ave. & Knole Rd. in Billingham, Stockton-on-Tees, UK. 24 foot concentric 7-circut classical and 18 foot 5-circuit medieval portable canvas labyrinths. Gardens: Open daily from 2nd. March - 30th. October. House, Tea rooms & Craft Gallery Shop: open Sundays to Thursdays, 30th March - 30th October. The Labyrinth is set in the gardens, of Pencarrow House & Gardens belonging to the Molesworth-St. Aubyn family. Brian, Rod and Cornish Magic. North West of England around 15 miles south of Manchester. Approx 1 mile into Bollington Village along the main street, turn right into Grimshaw Lane. The labyrinth is to the left where the Middlewood Way crosses Grimshaw Lane and before the bridge. See website for details - usually open daily, April through October. 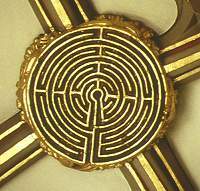 The labyrinth was installed in 2008/9 as part of the major restoration of this former monastic church which now serves as the parish church for the village of Boxgrove. the church is widely regarded as one of the most beautiful in England and is some nine hundred years old. The Parish Priest of Boxgrove, Fr Ian Forrester, commissioned a local artist, Sian van Driel to design the labyrinth which is made of contrasting Purbeck stone. 5 circuit, with a place for the paschal candle marked on the floor. First recorded 1783, but surely older. Situated on the NE side of Windmill Hill (also known as Victoria Park), alongside St.Luke's Road between the districts of Bedminster and Totterdown. The "Water Maze" is in fact a labyrinth, where the path is formed by a shallow channel of water that slowly flows from the centre out towards the entrance. 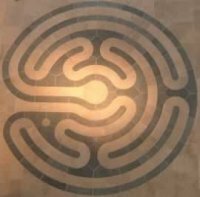 Installed as an artistic installation in 1984, the labyrinth is aligned upon St.Mary Redcliffe Church, 0.7 km to the NNW, and inspired by the labyrinth roof boss in the church. Pilgrim Paths is dedicated to providing creative and reflective prayer experiences. 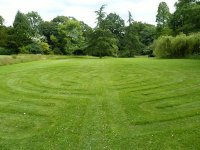 The labyrinth is available for retreat days, Christian conferences, church groups and schools in London and Southern England. Please see website for more information. Situated in the courtyard on the north side of the cathedral, accessed by a gateway from Angel Hill. Please call to make an appointment to walk the Labyrinth. The space is sacred and used for healing and meditation. 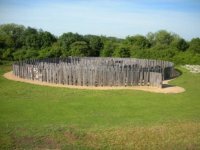 See also our web site for day and evening events held around the Labyrinth.